Linux No Payout Outs in 5 Days! The number of US Internet poker sites is on the rise, and one of the fastest growing is BetOnline Poker. 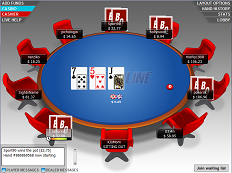 Launched in 2006 and a flagship of Action Poker Network, BetOnline Poker brings to the industry a powerful software platform, some of the best games and promotions, as well as world class customer service. Ironically, it is the infamous Black Friday that propelled BetOnline Poker's profile to a lead position in the US marketplace. The poker site has a gaming license from the Netherlands Antilles and is powered by PlaySafe software, which is secure, stable, and hence greatly popular. At peak hours, the tables of this gaming site will have up to 1,000 players. There is a wide range of deposit and withdrawal methods supported by BetOnline Poker too. More often than not, players in the US have the hardest time making deposits or withdrawals from online gaming sites due to the laws of the country. BetOnline Poker accepts deposits from these players, but the financial transaction process is a little complicated. Different deposit methods come with different demands that the players must meet. On the other hand, players from the UK and most of Europe have no problems making direct deposits into their accounts using just credit cards. BetOnline accepts all US deposit options and almost all credit cardsl work with the online cashier. If you live in the US, you will have the option of MasterCard, American Express, Visa, Bank Wires, Drafts, Money Order, checks, or Person-to-Person method. All these methods are simple to use, reliable, and 100% secure. BetOnline Poker players will have no problems whatsoever funding their account using a credit card. The poker room has the best processing rate in the industry and on the flip side, is also one of the fastest paying sites. When you make a deposit at BetOnline you receive a bonus, which is released by using the bonus code "promocode". There are times when your deposit via a credit card can be rejected, though, and this has nothing to do with not having enough money in your account. It could be something beyond your control, such as your bank refusing to authorize financial transactions with online gaming sites. There is no need to panic. If by chance, your credit card is declined you can contact BetOnline support by phone. The support team will assist with your deposit. As mentioned, BetOnline pays out quickly. Payouts requests are made any time of the weekdays between 9:00 a.m. ET and 1:00 p.m. ET except on holidays. To make a request, you must first log in to your account and then go to the Cashier page where you'll find a Payouts tab. Click on it and do as the instructions you find demand. You will have no delays or complications with receiving your payout if you have all the documents required for identity verification. A payout request is normally reviewed within 24 hours, and then the processing starts thereafter. There is a minimum and maximum amount requirement for each payout option and BetOnline Poker can change the figures any time without notification. You also receive a $50 discount every Friday of a 30-day period. Front and back debit or credit card copies. Bank statement or utility bill for your address confirmation. You send them via email. Alternatively, you can fax to 1-800-453-0804. To check your available account balance, log in and on the top right side, click on the down arrow that is next to your name. You do the same thing when checking Pending Wagers and Freeplay Balance.